How to Deal With Your Movie DVD Collection? It is annual spring cleaning time! At just a mention spring cleaning, there seems to be a collective groan of disappointment. A lot of people must be scratching their heads and figure out how to do with their DVD collection, gathering dust in penthouse. Are you a member among those people? If so, then it might be time to read the following article to teach you how to deal with a heap of movie DVDs? With the development of technology, more people especially the young are likely to download various of movies from Internet directly. Being cheaper, more convenient, or more space-saving than purchasing DVD discs maybe is the primary cause for them. But there are still many people who are keen on buying regularly DVDs, who like getting something tangible for their movie-purchasing dollars that downloading can not supply. Carry your DVD collection to your local DVD shop, sell to the shop-owner or whom likes them as second-hand-discs, and walk out with cash in your pocket. Avail yourself of Amazon’s Movie Trade-in service. It'll take longer than a visit to your local DVD store because you'll need to search Amazon to see which of your DVDs are available for trade-in, but shipping is free and you'll receive payment in the form of an Amazon gift card. You could also see what return you'd get from a online buyer such as SecondSpin.com. The easiest way out is to drag your boxes of DVDs to the curb or the dump, but you might also want to consider donating or recycling your collection instead. Recycling means your treasured DVDS won't meet an undignified end in a landfill, while donating also avoids the environment costs of the landfill and might give you a tax write-off at the end of the year. But more than anything, it's the sentimental factor that prevents some people from discarding their movie DVDs; there are a lot of memories in those jewel cases. If you have been pondering such a disc cleanup, Any DVD Cloner Platinum would be the best choice for you definitely, which is able to rip all your treasured movie DVDs to videos that can be saved permanently but without any space. 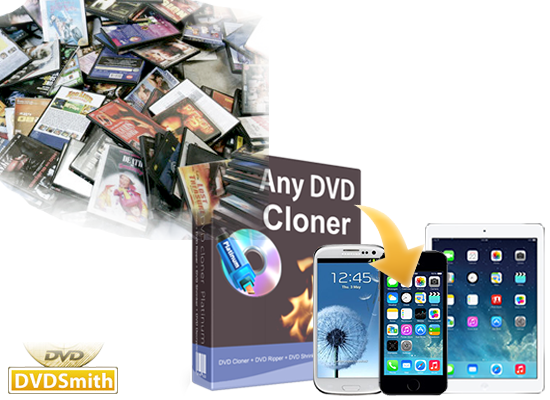 Any DVD Cloner Platinum is a professional movie DVD ripper to popular video formats like MP4, MKV, M4V M2TS, AVI, easy to play ripping videos on iPod, iPhone, iPad mini, PSP, Android devices like Samsung Galaxy s5, and even ultrabook like Lenovo IdeaPad Yoga 2 Pro.etc. How to Convert Movie DVD Collection to Videos With Any DVD Cloner Platinum? Note:If you are Mac OS user, you can download Any DVD Cloner Platinum for Mac. Note: There are 3 kinds of “Open Method”. It's recommended to use Lowly Enhanced or Highly Enhanced Open Method which may help you to find the exact real main movie title from a list of potential fake titles in some latest DVD movies. 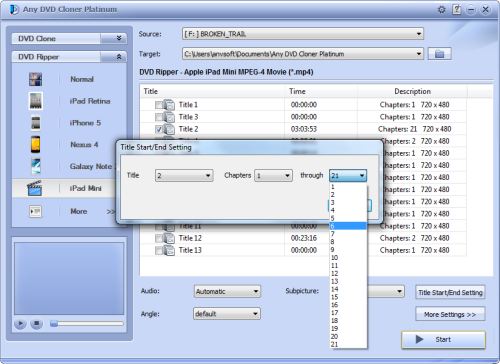 Step 3: Go to "DVD Ripper" panel and choose the portable device you have. Select "Normal" if your mobile device is not included. Step 4: Choose titles for ripping. The longest title would be selected by default. If you want to rip some chapters of the movie, click "Title Start/End Setting" and select the chapter you desire. You can preview any title in the previewing window. Step 5: Click "More Settings" to customize the output video picture, video and audio parameters according to your device. Or you can leave all by default settings. Step 6: Click Start button. Wait for a while, the output video will be generated successfully. Any DVD Cloner Platinum is also a amazing DVDs provides 4 flexible copying modes to copy, clone or compress DVD to DVD, DVD folder or ISO image with all protections decrypted and removed. Are you still holding onto your DVD collection? Do you still play physical DVDs? Where do your DVDs go after they fill your attic, basement and closet? 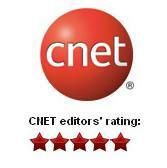 Any DVD Cloner Platinum is the best choice for you to convert all of them to videos. With above 6 steps, you can save those favorite movies permanently but will never have to worry about the enough space to store nor the frustrating scratches on its surface if you did not keep them well. Besides, you can enjoy the movies on any device you hold, iPhone 5S, MacBook Air, Samsung Galaxy S5, Samsung Note 3, Xbox One, ect. * How to Watch DVD on Microsoft Xbox One?